Hot and uncomfortable outside? Come inside, stay cool, and enjoy our summer Books-to-Movies Series! 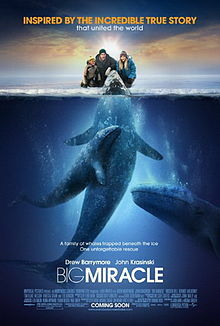 We're kicking off with Big Miracle, the story of a family of three whales trapped beneath the Arctic Ice. A Greenpeace volunteer and a small-town reporter go to extraordinary lengths to save the majestic creatures in this romantic adventure inspired by actual events.